There’s an old saying that goes “There’s no time like the present” and this is true of a lot of things in life. That doesn’t mean you should get a leak detection specialist in regardless of whether or not you have a problem – not at all. 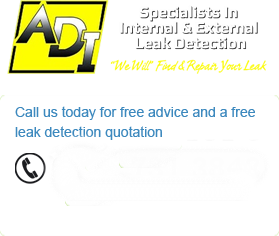 What we mean here is that if you think that you might have a leak somewhere on your property then the best time to contact ADI is right now. Leaving a gap of even a few days between when you notice the problem and when we arrive could be the difference between a standard leak investigation and a total water leak disaster scenario. Knowing the right “when” is tough for most people because you’re having to make a choice between spending money to have a real problem fixed or possibly spending money on a problem that either doesn’t exist or isn’t serious enough to merit real attention. That’s why ADI never charge for a call out – we don’t feel it’s fair to ask customers to pay for anything when we haven’t even had a chance to check the severity of your problem yet. There’s never a best time to ring a leak detection specialist but if you notice something isn’t quite right on your property like your radiators aren’t as hot, your water pressure is lower than usual, there are damp patches on your walls, the air in a room “feels” damp, your pools water level has dropped for no apparent reason or anything along those lines then you probably have a very good “when” reason to call ADI to have a look at the problem for you. Using your gut instinct and common sense is enough to help you make those “when” decisions – you really don’t need anything else to guide you. The reality is that most people only take action when something has actually gone wrong – like a water or gas leak in their house. They may have seen the warning signs for weeks or months in advance but chose to ignore them because in their mind the problem probably wasn’t that serious in the first place. And if you’re honest this is how you treat most things in life – like the person who refuses to visit their doctor in case they find out something is actually wrong with them. For some people living in ignorance truly is bliss. When ADI gets a call from a customer they’re usually already in the emergency “stage” of their leak problem so we’re used to reacting to these as quickly as possible. It doesn’t meant that we can visit you immediately because obviously we have a lot of other customers to care for. That being said we do our very best to see each of our customers as quickly as we possibly can. In the case of a real leak detection emergency you’ll need to stop the flow of water into your house and this means finding the main water supply valve and turning it off. Now the problem there is finding the water mains – it’s not always obvious. Your next alternative is to try and drain the mains supply by turning on all safe and non-leaking taps in your home to drain the water tank. The moral of this story is that if you think you have a water leak problem then don’t allow it to become an emergency that can cause thousands of pounds worth of damage – just call ADI and we can prevent those emergencies from happening in the first place. Being proactive is always a smarter choice. 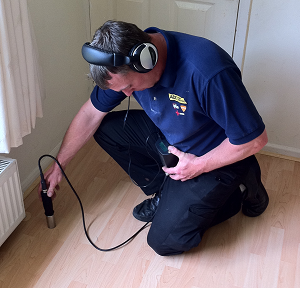 If you’re not familiar with leak detection it might seem like an odd thing to offer customers. After all detecting a leak doesn’t really sound that difficult does it? You just need to find the damp patch in the house and start digging there. Or if there’s a faint smell of gas in the room then the leak must be in that same room right? Wrong. Actually that’s very wrong. But that’s how most standard plumbing companies deal with the problem. They see the first trace of a leak and then start digging holes in the hope that they’ve found the actual source of the leak but in 90% of cases they’re way off the mark so then they take another educated guess and dig another hole hoping to find the leak. And so it goes on and your property is slowly being destroyed in the process. It’s only at that point that you start wondering “Do these guys have public liability insurance….who’s going to pay for the repair of all these holes?” Then the reality starts to sink in that there’s a pretty big difference between a bog standard plumber (no pun intended!) and a leak detection engineer. ADI leak detection engineers emphasize the difference even more. Once you see the skill and level of technology it takes to track down a difficult leak without having to dig several random holes and cause damage to your property in the process you can’t ever really understand it. Leak detection is an art and doing it with a 90% first time success rate is a combination of both years of training and using extremely advanced technology to track down the leak in the first place. Real leak detection is about operating in the most non-invasive way possible. It’s about professionalism and courtesy. It’s about great service. And it’s especially about leaving your home or business intact too. The quick answer to this folks is that anyone with a residential or business property will need leak detection sooner or later. It’s not a case of “If” but most definitely a case of “When” and we’ve been proven right on this over and over again. It doesn’t matter how new or old that property is the reality is that things go wrong. And things go wrong when you least expect it and usually when you least want them to. When it comes taking care of property most people fall into the “I’ll get around to it tomorrow” category. That’s not because they’re lazy – most of us are so busy with being alive and working it’s hard to find time to do anything else. Or worry about something that might not happen – at least in your own mind. But the fact remains that being pro-active when it comes to dealing with problems on your property is a far better option than trying to react when something actually goes wrong. So our customers are made up of two types of people. First you have the customer who spots a water leak and calls us straight away to track down the source then stop it. Secondly you have the customer who spots or smells a leak and decides they’ll call us “tomorrow” which really means they’ll call us in a week or two….maybe three. Then we get the call where we can hear the water pouring down the walls in the background. We’re not going to share the exact figures for each type of client but needless to say most people are in the “…take care of it tomorrow” category. Regardless of the situation you’re in right now we’ll be happy to help you either way – we just always want to promote the proactive message whenever we can because we hate seeing how much damage a serious water leak causes to customer property and the upset that goes with it. The classic image of a water leak is somebody standing in their kitchen with a bowl catching a continuous drip of water from the ceiling. They stand there looking tired and looking frustrated that they can’t stop this leak even though it’s nothing more than a few drops of water. This image doesn’t really convey what can really go wrong when you have a water leak or just how expensive it can be. Usually by the time you see actual water emerging from a leak in a floor, wall or ceiling then there’s been a lot of damage already done in the background. And this is especially true if the water has leaked through wood or plaster before you noticed it. If the plaster has gotten damp then entire sections will probably need to be replaced and if the wood or timber was load bearing then you’ll need to have that looked at too. But the leaks themselves can appear anywhere in both inside and outside your property. If the water leak is coming through the ceiling then it’s fairly easy to figure out that the leak is in piping somewhere in the attic. But the problem is when you get a water leak inside a wall – they’re far more complicated to track down because the water might be travelling from an either horizontal or vertical direction before it starts leaking out through the wall. Then you need to look at underground leaks where the leak might be several feet underground and that puddle of water you find is probably where the water found the path of least resistance to the surface where the source of the leak might be several feet away. Leaks can appear almost anywhere on your property so you need to be ever vigilant to stop them from causing you major financial problems down the road. This is usually the first question that pops into peoples minds when they find a leak on their property. Sure you’ve heard about leak detection specialists but what’s the difference between a leak detection engineer and a plumber – surely they both do the same job right? To be a fully qualified leak detection engineer you also need to be at the very least a competent plumber. But you need a different set of skills, knowledge and equipment than a normal plumber – if you want the job done properly. Well a qualified plumber is going to be able to repair a leak problem once it’s found but the problem is that they lack the equipment to actually track the leak down in a precise way in the first place. Repairing the leak is only part of the problem because you can see exactly what you’re dealing with. But when it comes down to tracking the leak to within a few centimetres of the actual source that’s when a normal plumber is going to have to bow out and have a leak detection engineer take over instead. 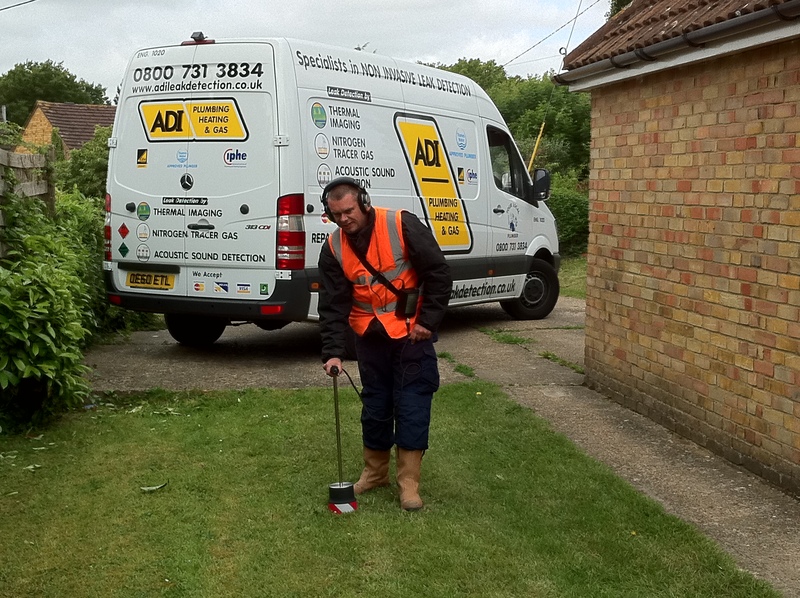 A qualified plumber will be able to fix your leak but to find the leak with pinpoint precision you’re going to need to hire in the services of an ADI leak detection expert. There’s a lot of work that goes into finding any interior or exterior leak on any property. Because the nature of how a leak starts and then progresses can be so complicated it takes some very sophisticated equipment to find the source of a leak. This is even more true if you’re dealing with an external leak which is probably buried under a layer of concrete and then several feet of earth. ADI engineers are equipped to find any type of leak though and the wide range of state-of-the-art leak detection technology that we can deploy on each leak investigation is proof of our commitment to finding leaks for our customers as quickly as possible. 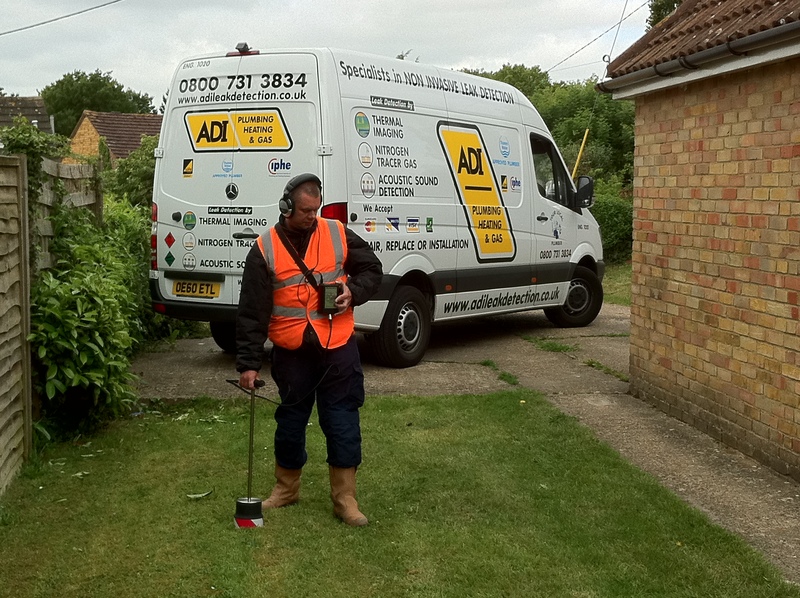 So for example if you look at underground or under floor leaks we have acoustic leak detectors that allow us to listen for and then pinpoint the exact location of a leak anywhere on your property. This means we can locate an external leak to within a few centimetres of the actual source. Working on the interior of a property we can use thermal imaging cameras, the same acoustic leak detectors, nitrogen hydrogen leak tracing gas systems and moisture detectors to find the source of the leak. 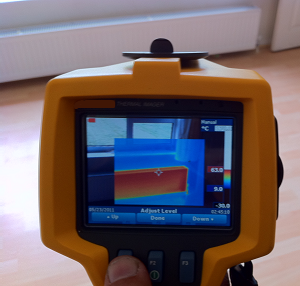 The thermal imaging cameras alone allow ADI engineers to find leaks that aren’t even obvious to a trained naked eye – we can quite literally see through your walls to find cold and damp patches behind them. That’s what happens when you’re dealing with a team of professionals like ADI. 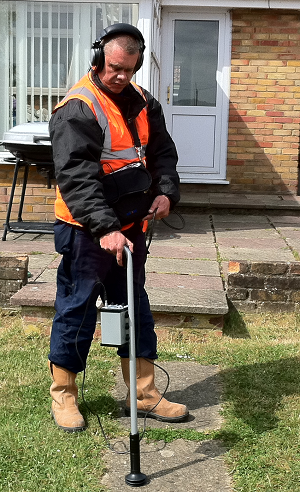 We do our very best to provide you with a completely non-invasive leak detection investigation so your property is left exactly as we found it at the start of our investigation. And it’s a combination of extremely highly tech equipment and very advanced training which allows our engineers to do exactly that. How can you tell the difference between clean air and dirty air in your home? Can you actually taste certain pollutants or would they just taste like nothing at all. And now with the autumn drawing to a close your friends and family are going to be indoors a lot more often so are going to be inhaling whatever toxins might be in your air for the next few months. But what type of toxins could be in the air? Well for starters if you have a problem with your central heating system you could have raised levels of carbon monoxide in the air you’re breathing. This can result in feelings of lethargy, headaches and in extreme cases with continued exposure to high levels of this gas the results can be fatal. You can’t see it, smell it or taste it but you it can still poison you. And if you have an unidentified water leak in your home this can cause damp patches on the floors, walls or ceilings of your property. 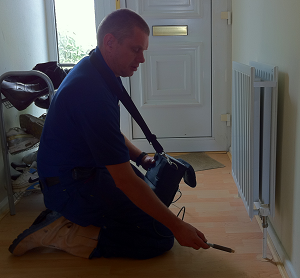 Given time, and especially during damp weather, these damp patches will develop into patches of mould and fungus. Some of these types of mould can then go on to cause a wide variety of respiratory illnesses and problems. One customer we dealt with suffered from chest infections every 3 months and wasn’t sure what was causing it until we found years of damp and mould hidden in his walls. Just because you can’t see dirt, mould or toxins in the air does not mean that they’re not there – most of the particles that cause the biggest problems are microscopic so unless you’re a lab technician you’d have no idea what you were even looking at in the first place. If you suspect you have a central heating, gas or water leak then please do call ADI today – we’ll find the problem and stop it from potentially damaging your health. You never realize just how much damage a water leak can house your home or business until the worst happens and you have a serious water leak problem. It’s not just the inconvenience of a water leak that you need to worry about although that is bad enough in and of itself. A more serious concern is the background structural damage that can be caused – ongoing water damage to timber supports can weaken them and cause overall structural damage. Then you need to look at other possessions like furniture or documents that could also be damaged when you suffer from a catastrophic water leak. What about all the electronic equipment you own, your furniture, any personal or business documents that are inside, clothing and of course wooden flooring and carpets. The cost of repairing a single water leak incident is at least several thousand pounds and that’s not even covering the items that can never be replaced like family photographs or other heirlooms of that kinds. Being proactive when it comes to dealing with detecting a leak in your home or business is very, very important. The simple act of picking up your telephone and calling ADI to check your property for you can save you literally thousands of pounds in repair and property replacement costs. 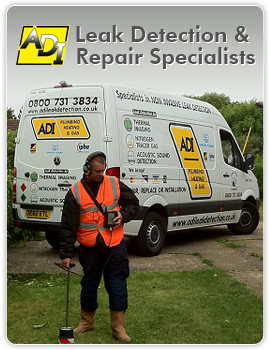 If you’re worried that you might have a leak of any kind on your property then the best thing to do is call ADI now and have one of our leak detection engineers investigate the problem for you. The work we do now to find the source of your leak can and will save you the future headache of a deluge of water destroying either the home or business you’ve invested so much time and energy in. There are two ways to find the source of a leak on your property. The first is to start digging holes in the general vicinity of the leak and hope that you get lucky and find the leak with the first few efforts. This means a lot of mess, a lot of fuss and a very low success rate overall and the potential for the leak itself never being found. Then you have the second method where you employ cutting edge technology to find the leak without ever having to dig holes. This is the method that a professional leak detection company uses so that your leak is found and your property stays intact during and after the leak detection investigation itself. ADI use a combination of thermal imaging cameras, acoustic leak detectors, moisture detectors, snake cameras and nitrogen hydrogen leak tracing gases to find the source of your leak and all of this is done in a 100% non-invasive and unobtrusive way. 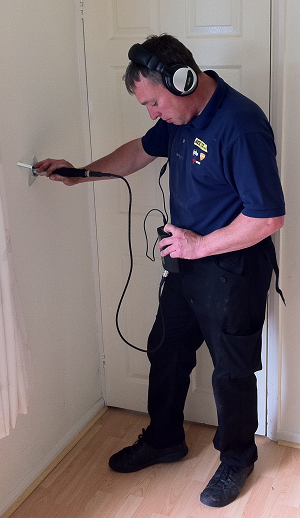 The leak detection equipment that we use allows us to locate any internal or external leak. These include water mains leaks, under floor leaks, leaks inside walls and leaks located in ceilings. Even if the leak isn’t obvious to the naked eye our engineers using both experience and advanced equipment can find even the most troublesome of leaks. 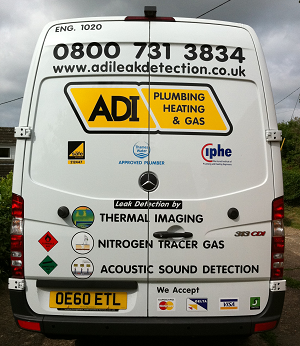 So instead of just hiring some random plumber who might or might not be able to find your leak why not just rely on the services of a professional leak detection company like ADI and let us find the leak instead? That way you’re saving yourself the headache of dealing with cowboys who don’t know what they’re doing and this will save you money in the long run. On that you have our word.